This adorable little Snowman will make a delightful memory! This nickel plate, silver, non tarnish ornament is 4 1/4" tall and 3" wide. 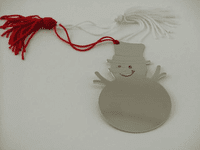 An optional white or red tassel hanger is included.